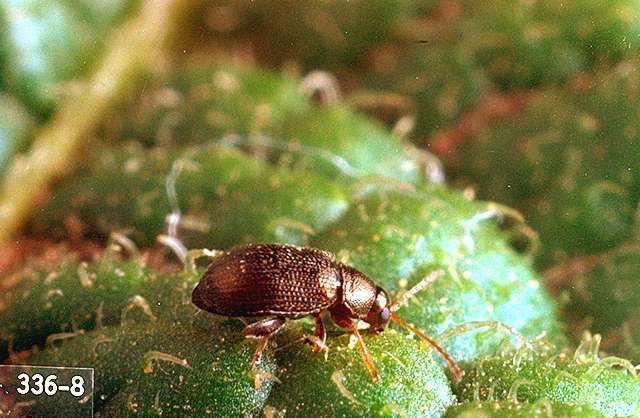 Weed control in adjacent areas will discourage flea beetles. bifenthrin (Brigade 2EC) at 0.033 to 0.1 lb ai/a. PHI 7 days. REI 12 hr. Do not exceed 0.2 lb ai/a per season. Allow at least 7 days between applications. bifenthrin (Capture LFR) at 0.04 to 0.08 lb ai/a soil application. Do not exceed 0.1 lb ai/a per season as an at plant application. bifenthrin/imidacloprid (Brigadier) at 0.04 to 0.15 lb ai/a. PHI 7 days. REI 12 hr. Do not exceed 0.2 lb ai/a imidacloprid and 0.2 lb ai/a bifenthrin. Retreatment interval 7 days. Do not graze treated areas or cut for feed. bifenthrin/zeta-cypermethrin (Hero) at 0.04 to 0.1 lb ai/a. PHI 7 days. REI 12 hr. Retreatment interval 7 days. Do not exceed 0.266 lb ai/a per season. chlorantraniliprole/lambda-cyhalothrin (Voliam Xpress) at 0.059 to 0.088 lb ai/a. PHI 5 days. REI 24 hr. Retreatment interval 5 days. Do not exceed 0.36 lb ai of lambda-cyhalothrin or 0.2 lb ai of chlorantraniliprole per acre per growing season. clothianidin (Belay) at 0.05 to 0.067 lb ai/a foliar or 0.15 to 0.2 lb ai/a soil. PHI 1 day foliar, 21 days soil. REI 12 hr. Retreatment interval 10 days. Do not exceed 0.2 lb ai/a per season. cyfluthrin (Tombstone) at 0.044 lb ai/a. PHI 7 days. REI 12 hr. Retreatment interval 7 days. Do not exceed 0.263 lb ai/a per season. deltamethrin (Delta Gold) at 0.018 to 0.028 lb ai/a. PHI 1 day. REI 12 hr. Retreatment interval 5 days. Do not exceed 0.168 lb ai/a per season. dinotefuran (Scorpion 35SL) at 0.05 to 0.18 lb ai/a foliar and 0.23 to 0.27 lb ai/a for soil. PHI 1 day foliar and 21 days for soil. REI 12 hr. Do not exceed per season 0.266 lb ai/a foliar or 0.532 lb ai/a for soil. esfenvalerate (Asana XL) at 0.03 to 0.05 lb ai/a. PHI 7 days. REI 12 hr. Retreatment interval 7 days. Do not exceed 0.35 lb ai/a per season. gamma-cyhalothrin (Declare) at 0.01 to 0.015 lb ai/a. PHI 5 days. REI 12 hr. Retreatment interval 5 days. Do not exceed 0.18 lb ai/a per season. imidacloprid (Admire Pro) at 0.25 to 0.5 lb ai/a. Soil application only. PHI 21 days. REI 12 hr. Do not exceed 0.5 lb ai/a per soil application. lambda-cyhalothrin (Warrior II) at 0.02 to 0.03 lb ai/a. PHI 5 days. REI 24 hr. Do not graze or feed to livestock. Retreatment interval 5 days. Do not exceed 0.36 lb ai/a per season. naled (Dibrom 8E) at 0.9 to 1.9 lb ai/a. PHI 1 day. REI 48 hr. Do not exceed 5.4 lb ai/a per season. Retreatment interval 7 days. Limit 5 treatments. permethrin (Permethrin) at 0.1 to 0.2 lb ai/a. PHI 3 days. Bell pepper only. Do not exceed 0.8 lb ai/a per season. Retreatment interval 5 days. thiamethoxam/chlorantraniliprole (Durivo) at 0.194 to 0.257 lb ai/a applied to the soil. PHI 30 days. REI 12 hr. Do not exceed 0.172 lb ai/a of thiamethoxam or 0.2 lb ai/a of chlorantraniliprole per season.